Welcome to the Sparkle N Sprinkle “It’s a Cultural Thing” Blog Hop. If you have arrived here from Shona’s blog then you are in the right spot. If you happened by , you can start back at the Sparkle N Sprinkle Blog to get all the details on prizes that will be given away . For this blog hop I choose to use stamps from the Brocade Backgrounds Set and tie in other items that represent my family’s cultural heritage. 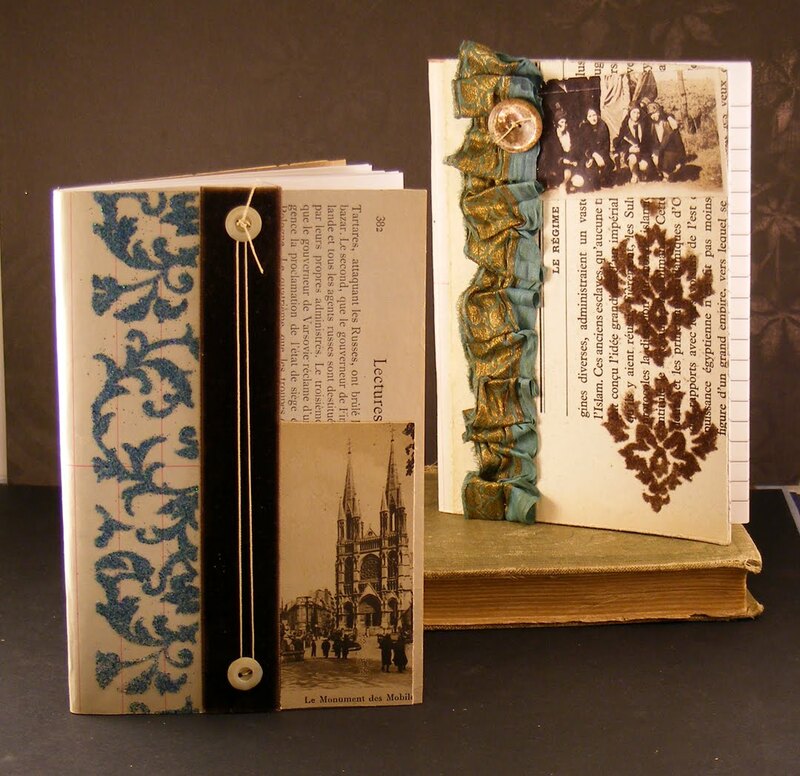 Here are two altered French Journals using book pages, ephemera, ribbons and buttons. The stamped images add texture with SNS flocking. Click HERE for directions on how these were made. My husbands’ mother was from Germany, she arrived in the United States in the 1960’s. Though we never had the opportunity to meet, Bob often says she had quite the crafty side and he thought we would get along famously. I had her in mind when I made this Altered Wood Block Art with German text. Thanks for stopping by, this was a fun theme and I’m sure you will want to hop on over to Barbara’s blog next to see her creations. Don’t forget to leave comments at each stop to become eligible for prizes. Angie, I love your journals ,and the beautiful ribbons you used-also the so feminine and pretty wood block, I will go have a look, dear. Angie, your products are gorgeous! Love how you tied the brocade images, embossing powder and flocking in with the flavor of decades past and present. Beautiful! I also peeked at your wrist bands in the SNS gallery! What a wonderful use of textures, colors and elements keeping with the theme, and which is wearable art! Thanks for making these perfect items for the hop! Really interesting journals. Love how they look old world. That ribbon is luscious! As I mostly do cards, I think these would be great ones. Angie, your creations are amazing! You really put love into these when you created them. Great altered pieces:) Love the story behind them...that just adds to the creations! Angie, your journals are gorgeous!! !Love the way you used the brocade backgrounds. The altered wood block turned out fabulous also. As always your pieces are GREAT!!! Angie, such unique creativity - it is going to be real fun to have you on board at SNS. Love all your projects! Angie WOW right up my ally. I love the brocade/dasmask flocking great background. The block is unique. I love the crafty-ness of your projects today! The are so unique to who you are and your family history...So impressive! Love the altered piece of wood art especially, so creative and speaks to my German heritage as well as my love of reading! Angie, your creations are beautiful! I love the story about each one. You did a great job! I love the ribbons. Beautiful! Your wood block is so cool! Beautiful! Love the ribbons on your cards. 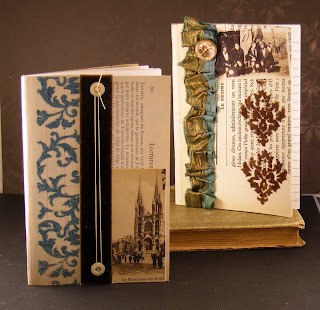 Your Journals are Beautiful love the you used book pages what a great idea the stamp is Image is cool looking. Love the flocked look. thanks for sharing and for the chance to win. The journals are lovely, but love the wood block. I am a big fan of altered art, though still new to it. The block is simple, elegant and beautiful. Thank you for sharing it! Gorgeous journals! Reminds me of the old flocked brocade-look wallpaper. Very vintage. Love the wood block too - wish I could see what the German print says. Beautiful! I Love both your creations! You have inspired me!! Nice use of flocking. I should move mine so I think about it more often! Wonderful projects, Angie, but I especially like the journals. Great idea to use flocking to give texture. Love the sepia photos! Love them Angie! Great idea with the notebooks, so pretty! Love them both and the pretty ruffled ribbon. What gorgeous and unique projects you made! The flocking adds such a nice texture. Wonderful projects. 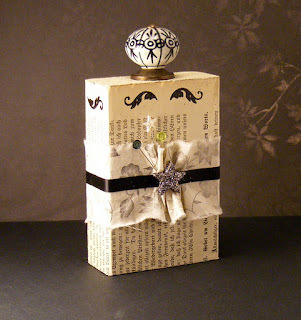 Love the journals and how you used the flocking for texture. Love the stories and personal touch on all your projects. I really like your use of flocking & sparklensoft on the two journals. The old photos & postcard are a nice touch as well. That is a very pretty drawer pull on your box. Wow! How beautiful and creative! 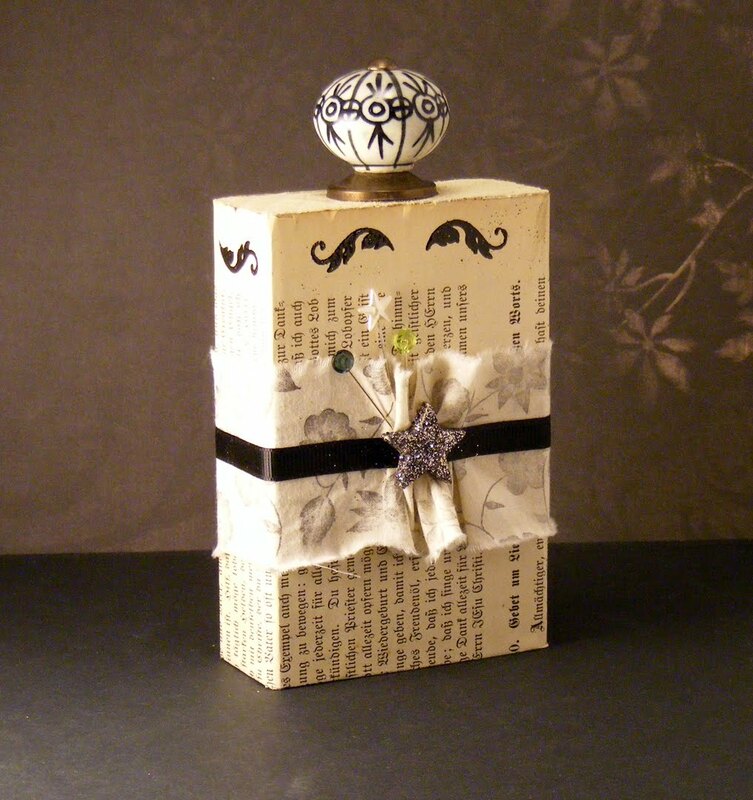 Great use of the ribbon and flocking. I love how you reminded me it's not all about cards! I need to branch out into other paper arts! the browns and blues make your craft serene looking. Paper crafts are beautiful. Your journals are so pretty. Love the flocking! The altered block is beautiful. What will you do with it? These wonderful projects are so different. That is what this blog is all about cultural diversity! I love the fact that you did something besides just cards. Fantastic job. I love that you shared some of your family history in your posts also! Love how you used the design element stamps - very nice. Really interesting projects Angie! And TFS your stories too, that was a nice treat!